Watching the trailer for the new James Brown biopic Get On Up, I was surprised to notice it prominently featured a scene in which Mr Brown is depicted walking into a room full of civilians and discharging a shotgun. I was surprised because this incident never occurred. It is a fabrication - and a potentially very damaging one. It is true Mr Brown walked into an office in the 1980s with a shotgun in his hand, but he never fired it and FBI files released after his death showed there was a lot more to the story than the public was told at the time; officers involved in the case fired more than 20 bullets at Brown while he was unarmed and had allegedly waged a campaign of racist abuse against he and his wife in the preceding months and years. I used this disparity between reality and the silver screen as the launch pad for a new Huffington Post article, questioning why filmmakers would arguably seek to justify cops' brutal behaviour by inventing an incident in which Mr Brown carelessly discharged a deadly weapon in a room full of innocent people. Is it really responsible to include fabricated incidents in films marketed as 'true life' stories? I have since discovered an additional key fact, which I would have included had I known about it at the time of writing. A police officer involved in the incident detailed in my article has since given an interview to Mr Brown's son Daryl, who has included it in his new book. In the interview, the officer states on the record that he believes police officers acted with unnecessary violence towards James Brown. 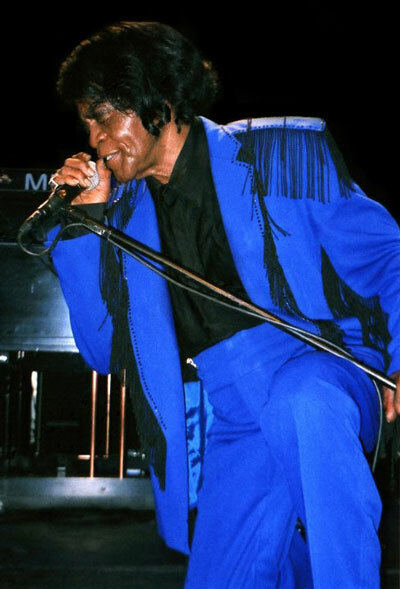 James Brown live in London, 2005. I've also since learned that there is a scene in the documentary James Brown: The Man, The Music and The Message in which Mr Brown sits in his truck, riddled with bulletholes made by police officers' weapons. Two of Mr Brown's daughters, one of whom I previously interviewed for an in-depth exploration of their father's humanitarian work, were annoyed by my article, both posting negative messages on Facebook. I have to say, I can't really understand their annoyance. I know they were involved in the film but nonetheless, you'd think they'd thank someone for pointing out that while the movie as a whole is apparently very good, the scene where their father recklessly endangers the lives of innocent people by firing a shotgun was not actually true. It's probably worth pointing out, in the name of balance, that other family members including Daryl Brown are opposed to and offended by the film, saying they were not consulted and that it contains lots of omissions and inaccuracies. The same complaint has been voiced by others portrayed in the movie, such as Mr Brown's former manager and some of his ex-band members. Click here to read my Huffington Post article.